I nod, as they lined up their chairs towards the tv to watch the opening of the world cup. The people we had shared the table with returned from their smoke break. I lean over to the guy and ask “These two guys are looking for a seat, but we are not sure if your friends are coming back” The guy leans in and says “It’s a problem in these parts” I turn back to him, confused. Shocked at the bluntness of this stranger, I didn’t know what to say. I’ve come across this from time to time in South Africa. Every time it happens I am shocked and have no idea how to respond to it. Living in Cape Town, I had almost forgotten about the problem of racism in Africa. I guess, I had been living in a bubble, in an international city full of broad minded people. We were at a bar in Luderitz, it was the start of a biker’s rally. We were surrounded by overweight guys in leather jackets, and women who don’t even know what bikes their husbands rode but at least they looked the part. We didn’t really fit in, in our t-shirt and jeans, with our cracked hands and chapped lips. The one guy I was talking to rode from Windhoek to Luderitz in one day, travelling over 160 kilometers per hour to get here. When I asked if he ever rode his bike on the dirt roads, he looked at me funny and said never! We were asked to stay for the big Saturday event and competitions but we really felt out of place and decided to leave that day. 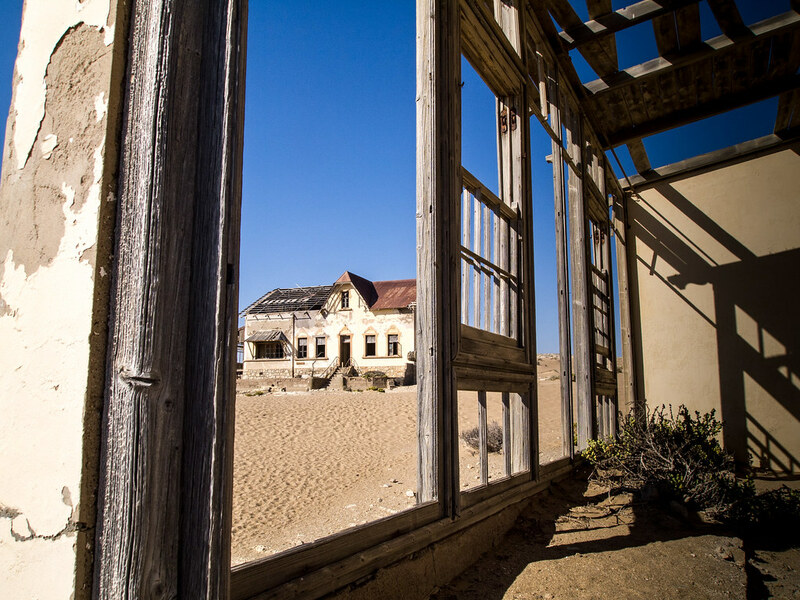 But not before going to visit the ghost town of “Kolmannskuppe” (or, nowadays, ‘Kolmanskop’). Kolmannskuppe once was a thriving diamond mine on the edge of the restricted diamond mining area called Sperrgebiet (Forbidden area). 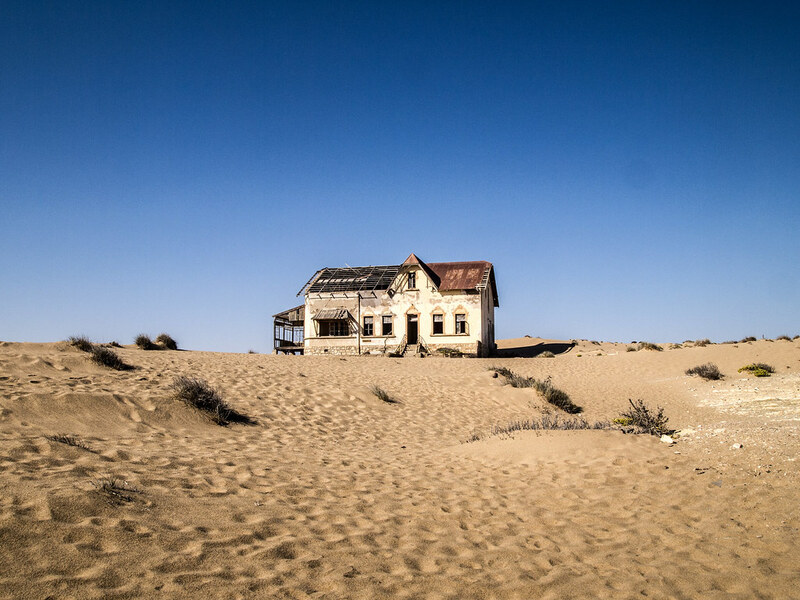 When the mine was depleted it was abandoned and the buildings left for the elements. 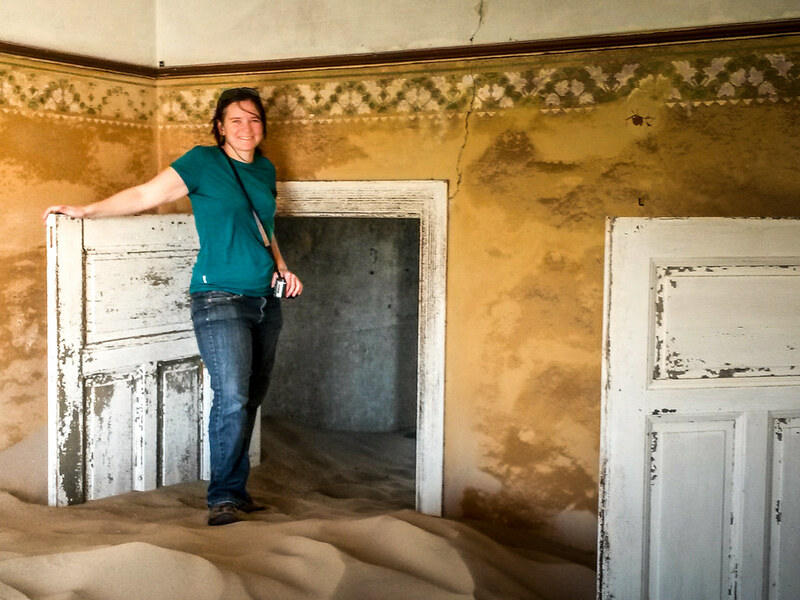 Over time the sand has eroded the buildings leaving some as skeletons and others just filled with sand. Mike and I spend a few hours crawling around in the hot sand exploring what remains there today. 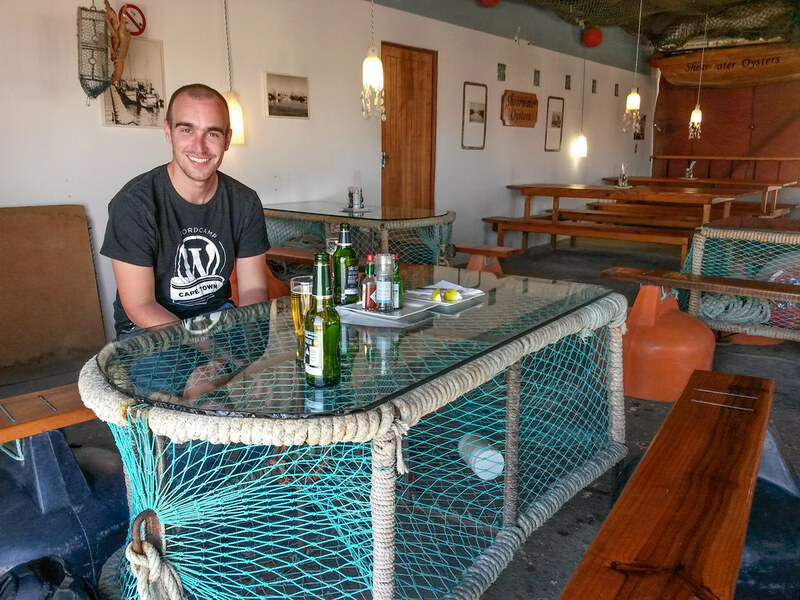 Once we had exhausted ourselves and now weighed a few kilograms extra with the amount of sand hiding in our hair and ears, we headed back into Luderitz to grab a beer and some fresh oysters at the oyster bar originally titled “The Oyster Bar”. 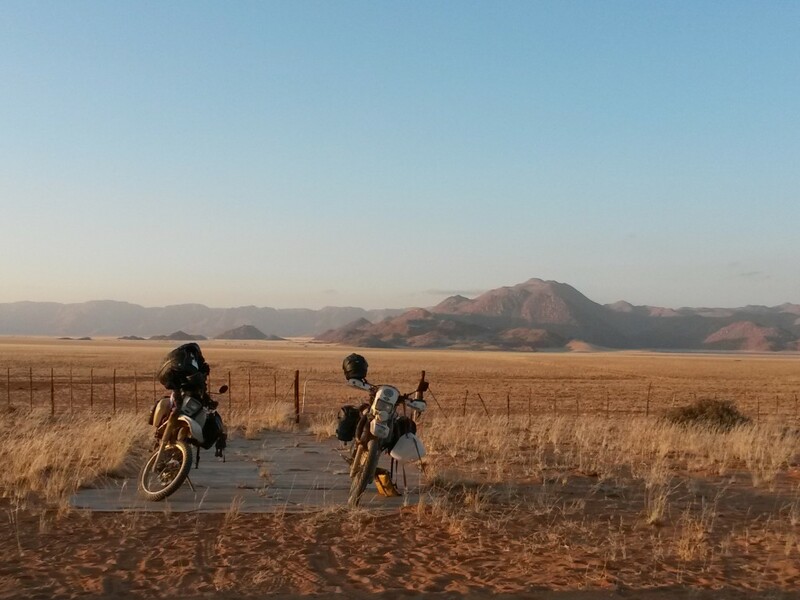 We left Luderitz Saturday morning as the bikers lined their bikes up in the streets. I noticed we managed to get a few head turns despite not riding a road beast or wearing our badges of pride. I guess it was amount of luggage that first got their attention, then the look of two scraggy looking dirt bikes riding past them, held their attention. I could feel the excitement in the air and pull of wanting to join in. But the pull of the road was far greater. It was somewhere I knew I fitted in perfectly. 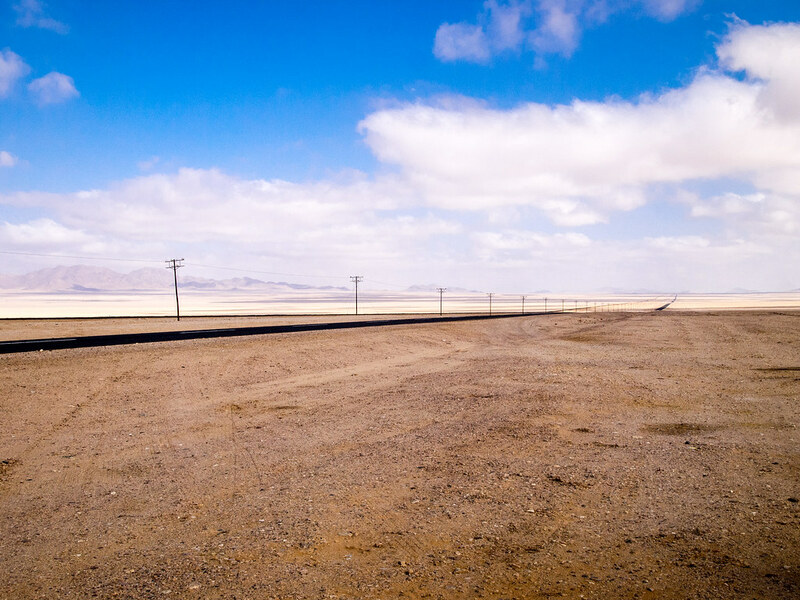 We retraced our steps along the long lonely asphalt road that sliced through the center of the desert. 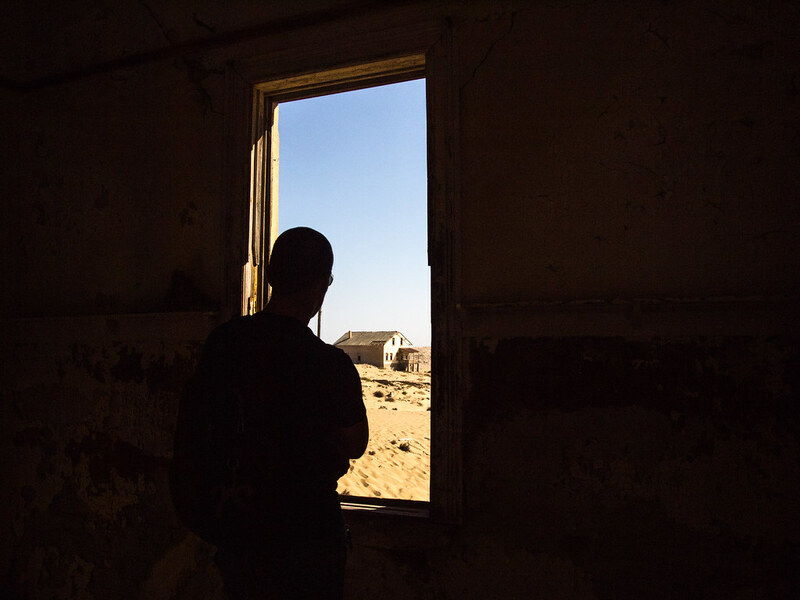 Luderitz was at the end of a dead end road. 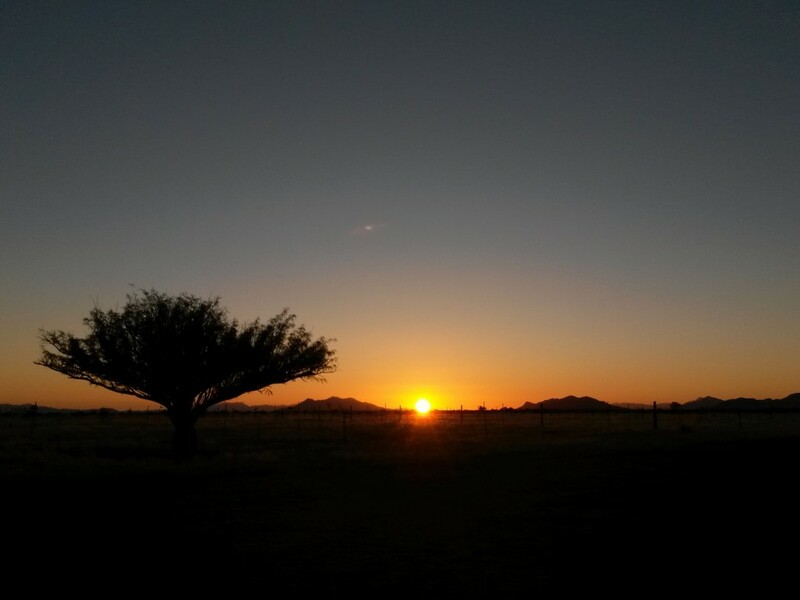 Our eyes darted along the horizon hoping to see a hyena, ostrich or a wild horse or two. Ahead of me, Mike flaps his arms and points towards the left. I turn to see a group of ostriches trying to run away from us, but infact they were just running with us. Later, we spot a group of wild horses, this time they were much closer. We waved at them to acknowledge them and carried on into Aus. This was the last fuel station until a junction called Betta 240 kilometers north. Immediately after Aus, we turned off the asphalt road and headed North on yet another beautiful wide, flat dirt road. Mike and I hadn’t planned a long day, it was another 80 kilometers until we would reach a guest farm that farmed horses. It meant we could take it easy, stop whenever we liked and just enjoy the ride without any worry. Two hours later, we arrived at the gates of the guest farm. I followed Mike down the single lane sandy driveway. Mike chose to ride on a wheel rut, I on the other hand decided to ride in the center of the road. As we got closer to the house, the sand got deeper and looser. Breathing in deep, I concentrated on increasing my speed to keep the wobble out of my bike. The driveway was only two kilometers long, but by the time we reached the farmhouse my heart was pumping! There was noone around, but Mike had been here before and we just went about having a late lunch and setting up our tent. As the sun started to set, we watched the horses gallop in from far away to drink from the trough – which just happened to be a few meters from out tent! It was just stunning, standing there all alone with only huge open paddocks around you. It made me feel small and insignificant. The next morning, I asked the caretaker of the guest farm what the road conditions were like to Betta. We had two options, ride back twenty kilometers to the main-ish road or follow this little loop around. However, the road condition we had experienced so far was terrible. From curb to curb there was corrugation that just shook you to your bones no matter what speed you hit them at. The manager didn’t do much to help our dilemma: “You should carry on this loop, or you will have to go back twenty kilometers. There is only a bit of sand to watch out for” I nod and thank him for his fantastic road description. 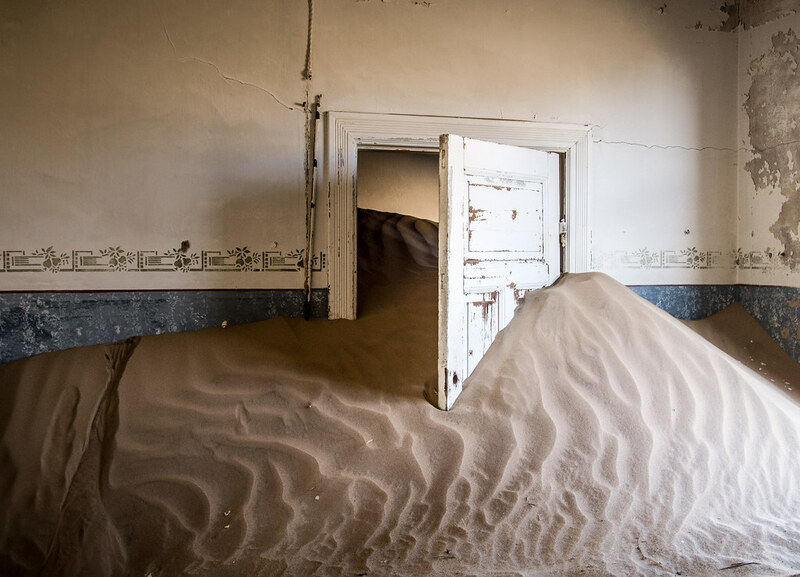 As I replayed the message in my head I realised he said “There is just a bit of sand to watch out for” I wondered if that would come back to haunt me. 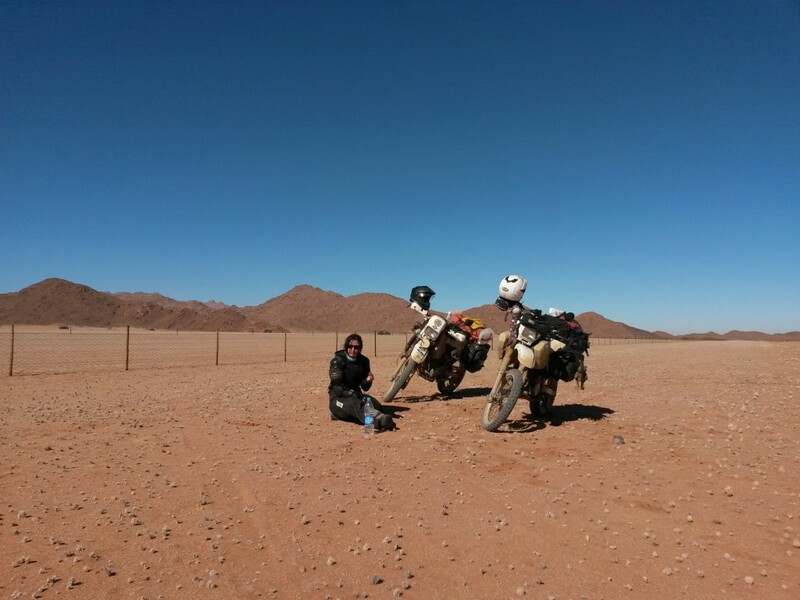 We rode on, enjoying the beautiful sunny day and amazing scenery that Namibia has to offer. We stop occasionally to take pictures and grab some water. We were in such a good mood, following the road closer and closer to a mountain range. As we turn the corner following the base of the mountain, we hit a section of sand. Then at the part where the corner was its tightest we hit a mixture of loose sand and hard waves of compacted dirt forming corrugation. This was the pits of riding. As your front wheel bumps into each ridge your back wheel digs down into the loose sand. Only speed is your friend as we bounce more or less in control around that corner. Ahead, I see Mike hit some soft sand. It sprays up everywhere as the back of the bike wobbles. Mike manages to pull himself and the bike together and keeps on ploughing through the sand. Seconds behind him, I confront the same section. I see his deep shaky tire tracks in the sand as I try not to follow them directly. I feel the back of my bike biting down and into the sand. I can not let it sink. I open up the throttle to give my rear tire some kick and hopefully project me across the top of the sand, rather than down and into it. Glancing up, I noticed Mike had stopped. My projected path combined with my speed meant I wouldn’t be able to stop in time. Alarm bells started ringing and panic set in. I pushed my bike out of the wheel rut we were following, across the mount of sand and into the next one. I brushed past Mike. I don’t think there was two inches to spare between our pannier bags! I was glad we didn’t hit. Shaking at the thought of a near collision, I climb off my bike. As I stood with my back next to it, looking back at Mike I feel the bike flop down on its side. Of course! I don’t manage to come off my bike when riding through sand (my worst enemy) but as soon as I stop, it decides to fall over. Mike comes to my aid and we pick the bike up together. We leave our bikes parked in the middle and discuss the crazy sand. We have been riding on it for about ten kilometers now, and we have no idea how long this will go on for. We drink some water, eat some biltong and discuss the idea to ride on the verge of the road instead. Walking around on the verge the ground feels more compact and we can see a car has done this before. We both agree we should do it. Mike lines his bike up a wheel track that will take him over the sand bank and hits it with speed. He makes it up and over and parks the bike on the harder sand. Just as we head back to my bike, we see sand clouds in the distance. It’s a pending car and my bike was still in the middle of the road. Nervous, I palm the relocating job off onto Mike. Just like he managed with his own bike, he rides mine up the sand bank and onto the verge with skills. The first car passed us, the second one and then a third one. I was then glad we were not in the middle of the road with nowhere to go, or riding through the sand when they came upon us. They all slowed down to take a look at us then carried on. Once all the cars had past and we didn’t see any more on the horizon, we got on our own bikes and proceeded to follow the fence line. Within 50 meters we ride into the tussac grass, bouncing over each one we couldn’t manage to avoid. It was getting ridiculous. I was laughing so much it hurt my stomach. Mike stopped his bike and said to me “I think the road is back to gravel again” I look over and sure enough it does look solid once again. Mike rides his bike back to the road but hits a really soft bit and sinks down into it quickly. I jump off my bike and give him a push out of it. As I rode my bike back to the road, I feel the soft sand, but I revved my bike higher and let the bike pull itself through. I welcomed the hard compacted gravel road once again. We rode on, without incident until we reached Betta: a one shop village with a petrol station attached to it. It was now two in the afternoon and we were starving. We ate lunch at the little restaurant and discussed what we should do. We only had two or three hours more hours of sunlight left. 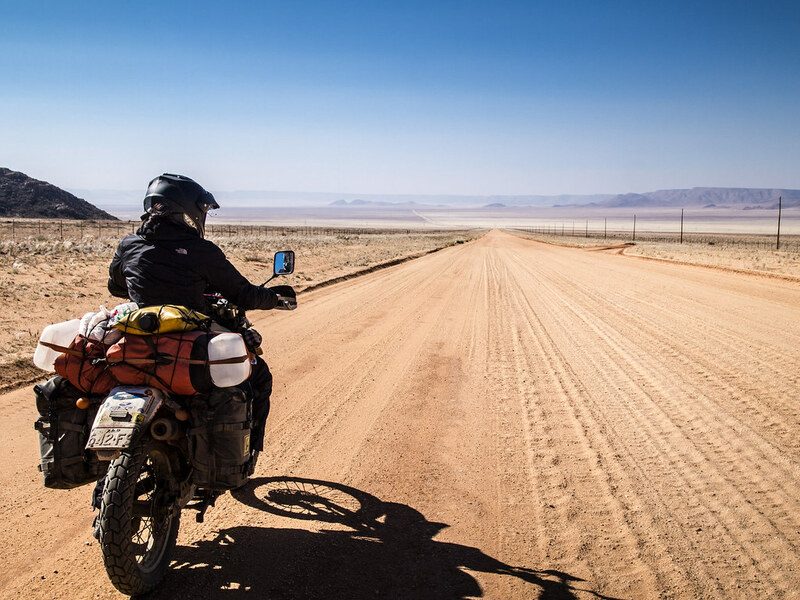 We still had 180 kilometers until we reached Sossusvlei. On an asphalt road we could definitely make that before dark, but with unknown road conditions it wasn’t worth attempting. We decided to pitch our tent at the local camping site and continue to Sossusvlei the following day. Brilliant. Great story and pictures. I can imagine the cuss words you used when the bike fell over! Brilliant scenery and I loved the deserted town. Would have loved to have been there with you. Thanks Chriss, Im glad you enjoyed this post. The scenery is amazing here and it is ever changing. Great blog, great photos! I find the racist thing interesting , I don’t suppose the attitude of generations will change in a hurry. Hi Greg, Im sure its changed a lot since 1981! Especially with what was happening in South Africa at the time. Ive heard Luderitz has grown so much, its actually a pretty tidy town these days even has two supermarkets! Thanks Sue – I always get blown away by it. I was quite sheltered from it in Cape Town for such a long time. It has changed a lot, but like everywhere you still find people like that. Thanks Fern! Im still following your adventures in New Zealand!